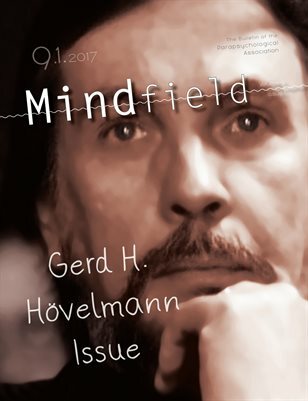 This issue of Mindfield is dedicated to the life and work of Gerd Hövelmann, and it includes two tributes from people who knew him well: Gerhard Mayer, and Roger Nelson. It also includes the abstracts in English for 2016 of the journal in German Gerd edited, Zeitschrift für Anomalistik. As an homage to another, less recent, great loss to the field, Mindfield reprints the first of a two-part series including an extraordinary paper by William Braud, Expanding Psi Research. This issue also concludes Carlos Alvarado’s bibliography on the history of parapsychology and Roger Nelson’s account of his 15 minutes of international celebrity as a recognized world inspiration. This issue also includes an intriguing report by Samuel H. Sandweiss and collaborators on a case of xenoglossy.